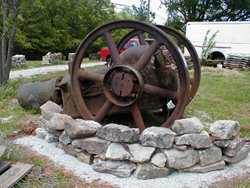 Many of our customers mistake this piece of yard art for an actual cannon. This is an antique one cylinder gasoline engine. Engines like these were installed in cotton mills and factories around the turn of the 20th century. This engine was maufactured by Fairbanks and Morse and was rated at 70 horsepower. A wide belt was looped around the large flywheels and over another pulley attached to a shaft. There were other pulleys attached to the shaft which then were used to operate the machinery in the mill.